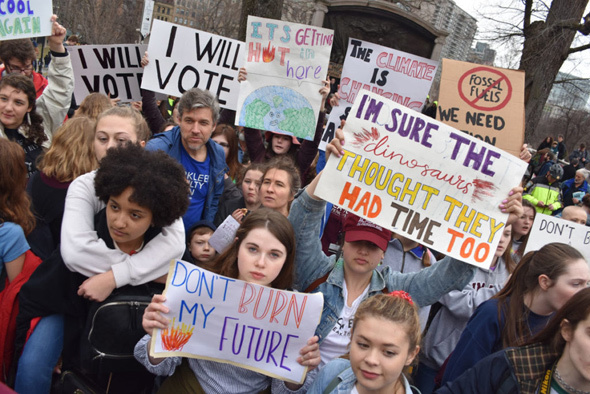 Greg Cook joined several hundred people at the State House today for the Youth Climate Strike. Reuters reports the Supreme Court has rejected an appeal from ExxonMobil over a Massachusetts court ruling that it hand over documents related to the company's efforts to not just hide evidence of climate change but to discredit the science involved. Read more. The Dorchester Reporter reports that in addition to the usual concerns about traffic and rootless condo dwellers, opponents of developer's plan to put 96 condos on the very tip of Port Norfolk have a new issue: Ever higher tides caused by climate change. A BPDA planner told a recent meeting that "over the next 50 years or so, the 2018 village will shrink to a sliver in the center as tidal waters eat away at the edges." The city announced today it's won $2.5 million worth of planning help from the Bloomberg American Cities Climate Challenge to reduce local carbon emissions by encouraging more energy-efficient commercial and institutional buildings and increasing non-car commuting options. Read more. Creative seawalls could protect Seaport Boulevard and provide new seating for pedestrians. The city today released plans for keeping rising seas from reclaiming all the parts of South Boston that sit on fill - which is much of the neighborhood. Read more. 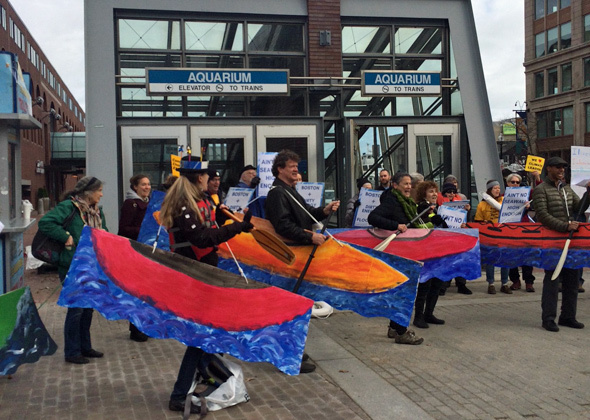 Greg Cook attended the Boston Rise for Climate, Jobs, Immigrant Rights & Justice rally in East Boston yesterday. The Supreme Judicial Court ruled today that Exxon Mobil has to hand over documents demanded by Attorney General Maura Healey in a probe of whether the company not only sat on information that proved the role of fossil fuels in climate change but actively tried to discredit the science of climate change to preserve its profits. Read more. Adam Castiglioni watched members of the Boston Climate Action Network hold a rally to demand Boston do more about rising seas outside the Aquarium T stop, a couple days after the T sandbagged the entrance and closed the station because of the once-in-a-generation flooding that has now happened twice in two months. Meanwhile, over at the Aquarium itself: Read more. 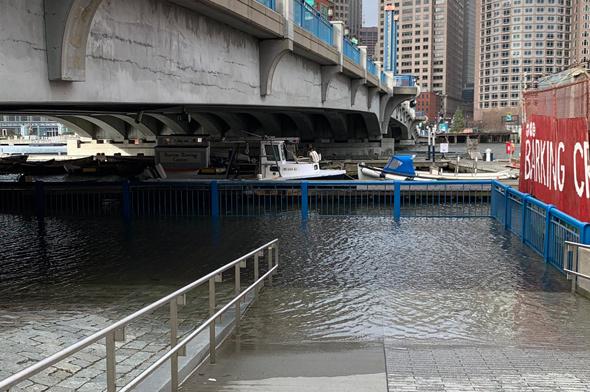 The Boston City Council agreed today to begin looking into ways to deal with flooding that go beyond requiring developers along the waterfront to take into account increased flooding due to climate change and sea-level rise. Read more. Brandy shows us the flooding starting this morning along the South Boston side of Fort Point Channel. New GE building would be designed to withstand a 500-year flood. Paul Lukez Architecture design for Columbia Point canal. Morissey Blvd. on the left. Paul Lukez Architecture of Somerville reports it's won an award at the annual World Architecture Festival in Berlin for its Hydroelectric Canal that would run from Carson Beach to Savin Hill Cove along Morrissey Boulevard as part of a complete re-do of Columbia Point to make it better able to withstand rising seas. Read more. 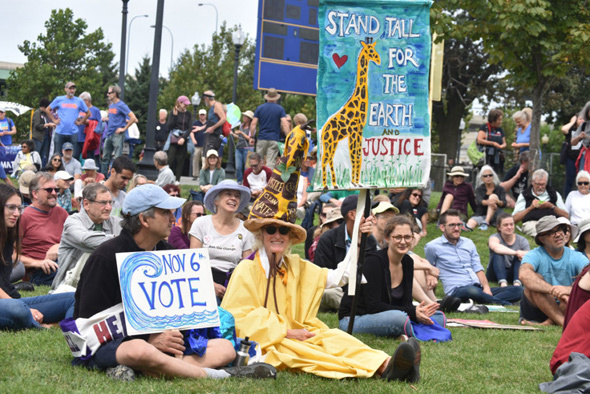 WBUR reports the focus will be on what cities can do to battle the problem even in the face of coal-slurping governments. WBUR reports on new vigilance in Massachusetts four years after the first outbreak of vibrio, caused by bacteria found in shellfish that was formerly confined to areas well to our south. Can city protect East Boston from devastating floods? Water landing at Logan after yesterday's flash floods. Photo by DS. 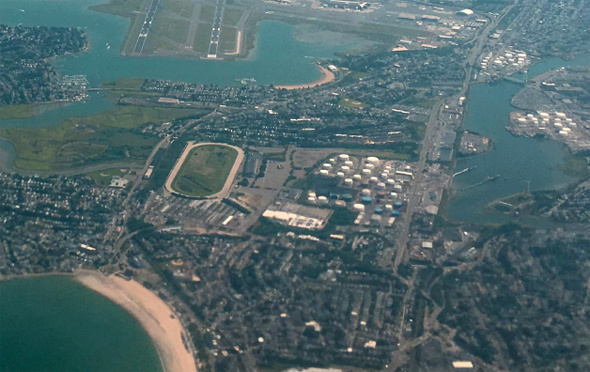 WBUR looks at city efforts to begin to protect East Boston - basically several low-lying islands stitched together with landfill - from rising sea levels and the potential for Katrina-like flooding. Climate Change is, as it says at the top, "an official City of Boston Web site" that contains climate-change data and files the EPA scrubbed from its own sites after Jan. 20. Matt Viser posts a copy of Gov. Baker's statement that Massachusetts will join the new US Climate Alliance, announced yesterday by the governors of New York, California and Washington state to uphold and go beyond the Paris Agreement on climate change. Baker is, of course, a Republican; the other governors are Democrats. Mayor Walsh had City Hall turned green in support of the Paris Agreement tonight.